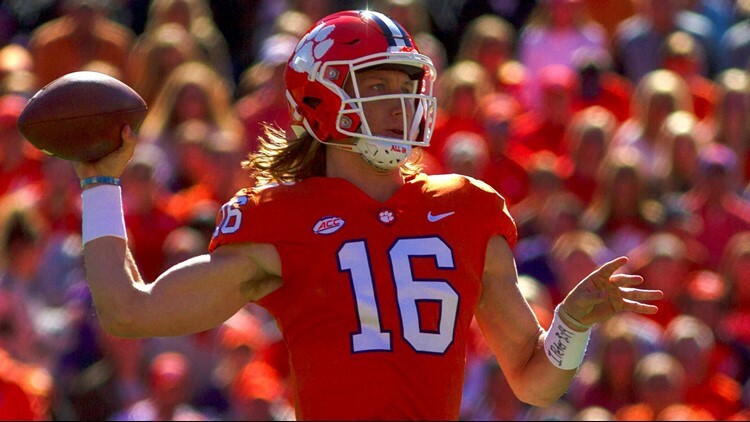 Clemson quarterback Trevor Lawrence is the only freshman among the 16 semi-finalists for the Davey O'Brien award. Trevor Lawrence was not on the preseason watch list for the Davey O'Brien Award, but Kelly Bryant was. The Davey O’Brien Foundation announced Wednesday that the freshman is one of 16 semifinalists for the 2018 Davey O’Brien Award, presented annually to the nation’s best college quarterback. This season, Lawrence has completed 123-188 passes for 1,549 yards with 18 touchdowns and only three interceptions, helping guide the nation’s seventh-ranked offense in terms of yards per game (538.0). He has already set school records for a true freshman in passing yards (1,549), passing touchdowns (18) and wins as a starting quarterback (five), and his 18 touchdowns rank first in the ACC despite Lawrence not starting any of the team’s first four contests. Fan voting for the second round of balloting at VoteOBrien.org will remain open until 1 p.m. ET on Sunday, Nov. 18. Fans are invited to cast their vote for the nation’s best college quarterback once daily per email address. The Davey O’Brien Foundation and its national selection committee will release the names of the three finalists on Monday, Nov. 19. The 2018 Davey O’Brien winner will be announced live on Thursday, Dec. 6.